BISMARCK – Men in state government and on the U.S. Supreme Court crippled Native suffrage recently, but women are leading the fight to bring Native votes in record numbers to the polls. Some women are offering rides on Election Day to Natives lacking transportation. Others are filming videos on social media trying to explain what Native people need to prepare for ahead of time. Secretary of State promises to handle address switches from a post office box to a physical address are failing as multiple sources have reported waiting for three weeks to hear back from a county 911 coordinator. On October 9 the U.S. Supreme court voted 6 - 2 to disallow post office boxes as valid addresses to use while voting in North Dakota. All identification papers must have a physical address, which means many Native IDs are useless. Two of three female Supreme Court justices, Elena Kagan and Ruth Bader Ginsburg, were the only dissenting votes. Approximately 70,000 state residents lack qualifying IDs and another 18,000 residents do not have supplemental documents that would permit them to vote, according to court documents. While the Secretary of State’s office has said repeatedly that the intentions behind discontinuing post office box addresses are benign, Natives disagree. 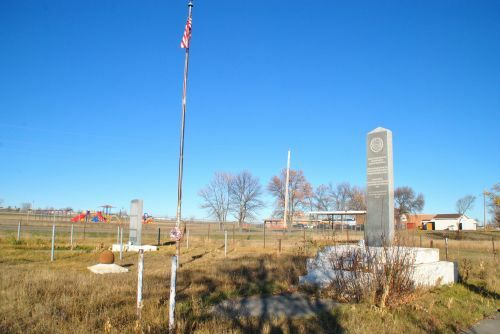 In 2016, six members of the Turtle Mountain Band of Chippewa sued North Dakota Secretary of State Alvin Jaeger claiming disenfranchisement and that the rule violated the federal Voting Rights Act. A year later state legislation approved House Bill 1333 clarifying that the only valid forms of voter ID were driver’s licenses, state identification cards issued by the Department of Transportation, tribal government official IDs, and a long-term care certificates with registered, and not post office box, addresses. U.S. District Court Judge Daniel Hovland later ruled the state must accept all IDs including ones with post office boxes as addresses. The Eighth Circuit Court of Appeals later appealed his ruling to the U.S. Supreme Court on September 24. One of the plaintiffs from the Turtle Mountain Band of Chippewa, Elvis Norquay, is homeless, but the U.S. Supreme Court said the state law allows Norquay to use a valid address prior to becoming homeless or the address of his homeless shelter as proof he is a North Dakota resident. Courts and legislators are concerned with fraud that doesn’t exist, attorney Tom Dickson said. 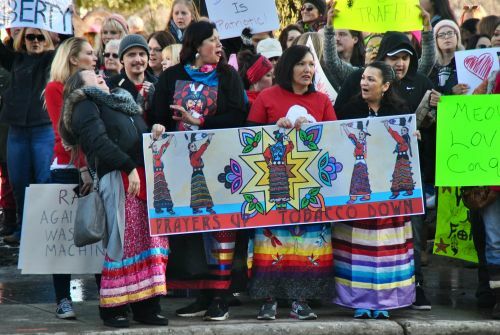 The six Natives suing Jaeger have obtained proper identification since they initiated the lawsuit, the U.S. Supreme Court stated, and justices based their verdict on the fact that none of the plaintiffs were being denied the right to vote any longer. There was no basis to grant them extraordinary relief, the U.S. Supreme Court stated. 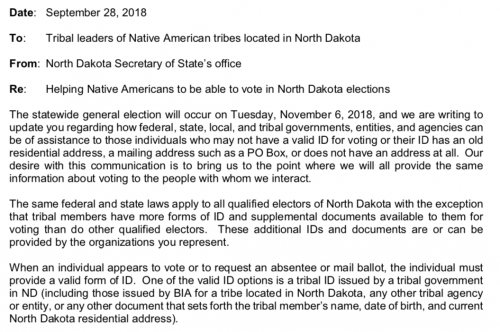 Thousands of Natives across America and hundreds in Standing Rock Sioux Reservation won’t be able to vote, especially with only a month left to satisfy the new requirements, Standing Rock Sioux Chairman Mike Faith said in a press release. Dickson, the main attorney behind the Turtle Mountain Band of Chippewa lawsuit, said the U.S. Supreme Court ruling is a calculated effort that is widespread across the nation -- from Georgia to North Dakota and beyond -- to suppress minority votes. “This is a deliberate plan by the Republicans nationwide, they’re preparing for minority rule in America,” Dickson said. “With voter suppression and voter ID laws… the angry white man constituency is getting smaller every year. Lissa Yellowbird-Chase is eager to vote on November 6. She’s part Arikara, part Mandan, part Hidatsa, and a registered member of the Standing Rock Sioux Tribe, and she has a car. Yellowbird-Chase believes that Indigenous communities should take the recent U.S. Supreme Court affirmation of what many are calling state voter suppression as a challenge to do whatever is necessary to vote. White privileged legislators have no idea about the troubles Native people go through on a day-to-day basis, Yellowbird-Chase said. When a single mother, or a family in a rural area perhaps without internet access is faced with survival or voting, the decision always turns to survival, she said. Complicate voting requirements and many more won’t take the time to prepare. Although Yellow-bird Chase hopes Native people are challenged by the ruling to vote, she knows many who won’t, or can’t. “When you have four little ones at home, and you don’t have a vehicle, and you don’t have an ID, what are you going to do?” Yellowbird-Chase said. “Who is going to watch those kids? Who is going to walk across town to cast that vote? In some cities, public transportation is closed by the time they get off work? What is your priority: survival or casting that vote? The primarily Republican attempt to suppress Native voters is creating a sub-sub class of poor and Indigenous people, she said. In an election year that has seen a record number of Native women running for office – at least 60 women, with 51 for state legislatures, and others for U.S. Congress and state positions, Ruth Buffalo is fighting for a seat on the state’s House of Representatives. She is a member of the Mandan, Hidatsa, Arikara Nation, and running for the legislature in South Fargo’s District 27. Buffalo was disappointed with the U.S. Supreme Court’s decision, saying every North Dakotan must have the proper infrastructure in place to practice their right to vote. The state’s hurry to push the emergency appeal through was a disservice to North Dakotans. 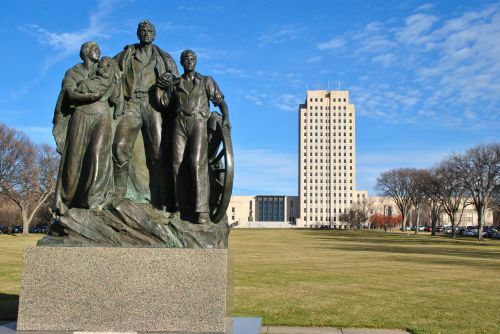 The state should create mandatory outreach programs to help educate high school seniors and leaders throughout North Dakota to encourage voting, Buffalo said. Nicole Montclair Donaghy is from Standing Rock, but lives in Bismarck, surrounded on a daily basis by racism. As a child, trips to the grocery store became nightmares. “People were yelling and telling us to go back to the reservation,” Donaghy said. She also played basketball and remembers being called horrible names. The racism has once again crept into legislation and is directly affecting people from Standing Rock, she said. “Looking at the way our elections are, how Native people are being limited to participate in elections in rural areas, and now they’re making it harder for people without physical addresses,” Donaghy said. “It is very blatant to Native people and to me it is another attempt to overrun the citizens. Jessie Quinn is one of many Bismarck residents offering transportation to the voting booths on Election Day because the state is at a tipping point, she said. Quinn was born and raised in coal country North Dakota. She’s “white as Casper,” but until the Dakota Access Pipeline controversy two years ago she never thought racism existed in the state. Quinn hopes to offer 100 or more trips to the polls on Election Day, she said. The Standing Rock Sioux Tribe will also be sending out drivers to help bring people to the polls, according to a press release. The recent nomination of Judge Brett Kavanaugh to the U.S. Supreme Court reaffirmed Quinn’s fears that she could no longer be quiet. Women are at the front lines for many Native issues, Lissa Yellowbird-Chase said. North Dakota’s only Democratic senator, Heidi Heitkamp, known as one of the nation’s most endangered senators in her race against challenger U.S. Congressman Kevin Cramer, a Republican, also condemned the Supreme Court’s decision. As a member of the Senate Indian Affairs Committee, she has been working since 2014 on the Native American Voting Rights Act, a bill that would increase voter protections and poll access to Indigenous communities. Until 1957, Natives were not allowed to participate in elections. “After the Supreme Court declined to hear an emergency appeal based on the confusion created by reverting back to North Dakota’s burdensome voter ID law that makes it harder for Native Americans to vote, our bill is especially needed to prevent Native voters from being disenfranchised,” Heitkamp said. Nicole Montclair Donaghy is confused about the memo from the Secretary of State’s office saying that people with post office box addresses could contact their county 911 coordinators to start the “no charge” process of assigning an address with a description of the home’s location. Perhaps county coordinators didn’t see the memo, Donaghy is wondering, because she has friends who contacted 911 coordinators three weeks ago, but haven’t been called back. She is trying to help people get their addresses changed, and organizing transportation to and from voting booths. “I’m seeing so many things, trying to discover what is acceptable,” Donaghy said. “It’s a lengthier process and either the county boards don’t have the capacity to take on 300 calls, or do they know they have this responsibility, or are they prepared? The North Dakota Secretary of State’s office said they had received no complaints, and referred all questions to the 53 different county 911 coordinators. In Standing Rock, many Natives do not have residential addresses; tribal IDs often do not list residential addresses. Natives across the country are disproportionately homeless, and few Natives have driver’s licenses on and near reservations, Mike Faith stated. Joshua Boschee, a Democrat who is running for Jaeger’s position as Secretary of State this year, said he has been working for months on helping people switch to physical addresses, and that he has heard reports of people being put in waiting lines. Sounds simple enough, but also complicated enough for Boschee to encourage anyone interested to help with direct voter contact, including door knocking and phone calling. “We only have 30 days to do this, too,” Boschee said. “It certainly is going to be a challenge for some. They’ve had a year’s time to get those updated, now we have 20 some days. This is where the Secretary of State’s office needs to be all hands on deck educating people. Francine White, a member of the Three Affiliated Tribes, said in a video posted to Facebook that the state is accepting only tribal IDs with a physical addresses, reminding people to change their post office box addresses or by bringing accompanying information that includes a physical address. There is no fee for changing a post office box address to a physical address, the North Dakota Insurance Department reported. If a voter’s ID card does not contain a residential address or date of birth, the person may submit identification along with a current utility bill, bank statement, a paycheck, or documents issued by the federal, state, local, or tribal government. The canvassing board meets immediately after votes are in, and usually at the polling place, according to the North Dakota Century Code. On the sixth day following every election the canvassing board meets again to recount and make corrections if needed. While the state feels it has given ample notice to voters, in the real word thousands of people will not, or cannot, vote, Lissa Yellowbird-Chase said. Another aspect of obtaining the proper identification is the money, needed for internet, telephone, transportation, or even a home or apartment. Ruth Buffalo said the state should focus more on building relationships to mitigate party line challenges such as the voter ID changes. 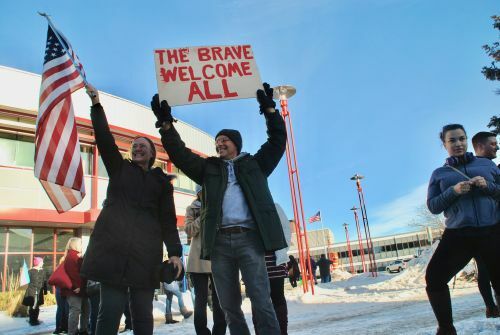 “We need to work to build a healthier, cohesive, stronger North Dakota instead of continuing to disenfranchise voters even further,” Buffalo said. North Dakota’s stricter voting laws will possibly have an opposite effect than apparently desired by currently elected officials, attorney Tom Dickson said.